Starfish, or sea stars, come in about 2,000 varieties. Different species live in each of the world's oceans. While five-armed starfish are most recognizable, some species can carry between 10 and 40 arms. Sea stars' vibrant, textured and colorful appearances make them popular additions to saltwater aquariums. Luckily, many starfish can be cared for with relative to moderate ease as long as you are diligent in the upkeep of the animals' habitats. It is vital to research prospective starfish pets, as different species require different accommodations. On average, 30-gallon aquariums tend to fit the bill. Starfish will require full-spectrum lighting and powerful water filtration systems. Water temperatures should stay between 72 and 78 degrees Fahrenheit, while salinity levels can range anywhere between values of 1.020 to 1.026. Any changes in these measures must be slow and steady. Starfish need pet-store-bought rocks and other terrain decor to mimic their natural habitat. Starfish are exceptionally sensitive animals and can be severely harmed by sudden changes to the salinity and/or pH values of the water in which they live. That's why you must acclimate sea stars to tanks carefully, deliberately and, most important of all, slowly. Before introducing a starfish to your aquarium, turn off the tank's lights. Float the bag that contains the starfish atop the aquarium water for at least 15 minutes, normalizing the water's temperature inside the bag. Open the bag, discard some of the water so as not to overwhelm the aquarium, and add about 1 ounce of aquarium water to the bag and wait three minutes. Repeat this process until several cups of aquarium water are in the bag. Discard the majority of the remaining water. Gently release the starfish into the aquarium and restore the tank's lights. The majority of starfish are carnivorous; they will prefer to feed on thawed commercially frozen seafoods. Again, research your starfish's species for further details regarding diet. Some small species of starfish can feed on microscopic forms of algae. Supplementing your sea star's diet with expert-recommended vitamins can also benefit its health. 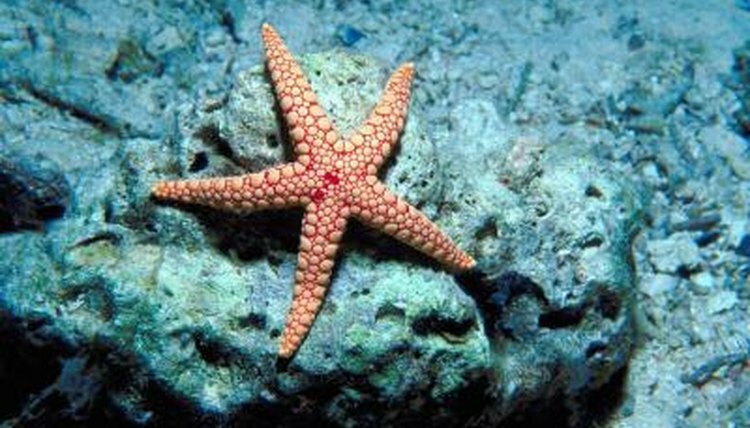 Depending on your sea star's species, feed the animal on a daily or weekly basis. Offer a varied diet and take care never to overfeed. While sea stars tend to get along with most fish species, harlequin shrimp and larger sea stars will consume smaller starfish. To further keep an eye on your starfish's health, look for the appearance of white spots or fungus, loss of color, disfigurement, limp or pliant limbs, or absence of reaction to stimuli. If any of these symptoms occur, test and address your aquarium's water quality. As a rule, it's best to avoid overcrowding your aquarium: Sea stars natural sensitivities can cause them to become stressed and, in turn, more susceptible to illness. How Can Too Much Calcium Affect Aquatic Life?